I had decided to spend my 20 days vacation this time in India and soak in the culture. I wanted to visit Delhi, Goa and Kerala in my trip . This article is not going to be about my trip, but rather about how to get India E-Tourist visa for France citizens and how you can get your visa cheaper than official government fees. Tourists from France accommodate for 6% of the total number of tourists to India, this boom has happened because of the implementation of E-Tourist visas.This article will help citizens of France in applying for India E-Tourist visa. This article will guide the citizens of France in applying for an India E-Visa. Do citizens of France need a visa for travel to India? It is mandatory for foreign nationals to have a valid travel document while arriving in India. Tourists who arrive in India without a valid visa (travel document) will be denied entry and they will be deported back to their home country. Is it possible to get Visa on arrival in India for citizens of France? The government of India in 2015 replaced the visa on arrival system with Electronic Travel Visas. ETVs can only be applied online. E-Visa approval takes a minimum of 2 days.It is mandatory for citizens of France to have a visa while arriving in India. It is important to have the correct visa while one arrives in India. The visa has to be chosen depending on the purpose of visit and duration of stay in India. Regular visa (Sticker visa): Foreign citizens who wish to stay in India for longer duration can apply for this visa. Sticker visas are generally valid for a period of up to 10 years with multiple entry benefits. Unlike E-Visas application for sticker visas cannot be made online. One needs to fix an appointment prior to the visit to a concerned Indian embassy and do the application. Sticker visas include -Conference Visa, Diplomatic Visa, Employment Visa, Emergency Visa, Entry Visa, Journalist Visa, Medical Visa (for long-term treatment), Missionaries Visa, Tourist visa, Permit to re-enter within 2 months, Research Visa, Student Visa Transit Visa, Intern Visa, and Film Visa. Citizens of France visiting India for tourism and who do not wish to stay for more than 60 days can apply for an E-Tourist visa. Application for E-Visa has to be made a minimum of 4 days prior to your journey. 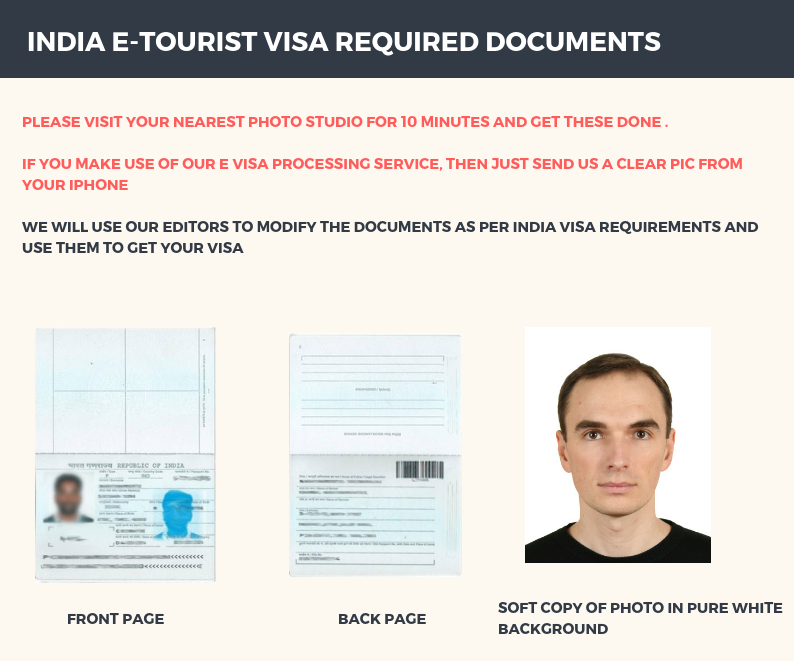 What are the required documents for getting India E-Tourist visa for citizens of France? If you decide to process your visa through an agent, you only have to send them a picture of your passport and photo taken in your iPhone or any camera with a decent quality, which they will edit to suit the required specs. The image given below is an image explaining the requirements by one of the India visa processing agents. One needs to very careful while uploading the scanned copies of photo and passport as even a small change from the required specification may result in rejection of the application. The India visa agent with whom we process the visas through accepts photos and scanned copies in any format. While processing the application they would edit them to suit the requirements. On the contrary, if you want to do the application by yourself first edit the scanned copies to the desired specification before you begin applying. Gather all the patience you have and start! Online scammers have become a threat to people who want to avail visa processing service.Lately, we ourselves have come across such scammers. They provide all fancy offers like instant visa approval, the extended validity of visas, etc. You need to remind yourself that India visas are issued by the government of India and no agents have the authority to issue a visa to you.In the official website of the immigration department, it is given that it takes a minimum of 2 days for approval of your E-Tourist visa and that the E-Tourist visas are non-extendable. The most commonly seen scam is “express visa for 300$”. The government of India does not provide any provision for an express visa. Be very careful while you come across such claims to avoid being a victim of a scam. Initially, you need to make around 30-50% of the fee as advance payment for the agent to start processing your visa application. You only need to make the rest payment after you receive a confirmation from the agent. indiavisainfo.com: This is one of the agents with whom we have worked with in the past. Your visa application will be taken care of by one of their experts. They charge $50 for getting you India visa. If you need help with only completing the payment for your application, then you need to pay only $25. How much does it cost the citizens of France for Indian E-Tourist Visa? It costs 50$ for citizens of France for Indian E-Tourist Visa this does not include the service charge charged by your credit card companies. If you want to process your visa through an agent thy charge around 50$ additional as their service charge. Application for E-Tourist visas can be submitted either through the official website n of the Indiagovernment or through a reliable India visa processing agent. Applying through the official website is not a walk on the beach, it takes a lot of patience and luck to get the job done, for this reason, applying through a reliable India visa processing agent is the better option. The agents will make sure that you get your India E-Tourist visa with minimum trouble. The agent we would recommend our customers is indiavisainfo.com as we have been doing business with them for the past few years.They always made sure that they give the best possible service to all their customers. The experienced and dedicated workforce they have always get the job done in the best way possible. They charge only 50% of the fee as advance and customers only have to make the rest 50% payment after receiving a valid visa ID (which can be verified at the official website of the Indian government). They accept payment via Paypal which gives you assurity for every payment you make. In other words, you will be protected by PayPal for any fraudulent transactions. You need to make a payment of 25$ in advance.After you submit the form an agent will call you within 2 hours to and he/she shall be assigned to process your visa. The agents with them have a good command over the English language so communicating with them will not be difficult. They will call you once your visa is approved and provide you with a visa ID. You can verify this ID from the official website and make the balance payment to get your visa. The portal where one has to do part-1 of the application process is so unreliable. Some people have complained about the site becoming unresponsive when they are only 1 click away from completing the first part.This issue has always been there, poor maintenance of servers and improper design are the reasons for this issue. Therefore, the only feasible solution to this issue is to hire an expert visa agent who constantly monitors the situation and has enough experience in this field. These agents charge a mere amount of service charge and they offer you a hassle-free service. After going through all the hurdles in the application portal you reach the next stage, where you need to make the payment against your visa application. Things won’t be easy here too, the banks are not capable of handling international transactions. You only get a maximum of 3 attempts to make a successful payment. Therefore, If you are unable to make a successful payment in 3 attempts they will block your application Id. You will have to do the part-1 application from scratches again. Internet banking facility offered as an alternative also has the same problems. Does India provide visa on arrival for French citizens?